← Karen’s Killer Book Bench Blog Subscriber NOVEMBER Winner! CHARLENE RADDON’S Character, Elizabeth Anne Webster!! INTRODUCING….Character Elizabeth Anne Webster, DANCES IN MOONLIGHT by CHARLENE RADDON. Elizabeth Anne Webster. Call me Beth. Francine Gibbs is my best friend. We like to read books about other peoples and lands, like The Last of the Mohicans. Love that book. At the Runyon’s Finishing School for Refined Young Ladies where we went to school, no one wanted to be friends with a girl me who has the Devil’s kiss on her cheek, or a girl like Francine, who is illegitimate. The only family I have is my parents. Father is a Brevet-Major in the Army. He commands the Fifth Infantry at Camp Floyd in Utah Territory and detests Indians. Mother hates living on Army bases so she lived in Boston until recently when she died. Her inheritance from her grandmother allowed her to live in high society. I hadn’t seen her since she sent me to school when I was twelve, four years ago. She never paid much attention to me. Father can’t stand to look at me because of my birthmark. I barely know him. Yes, my birthmark is like a lip imprint only a little faded on one side. It’s high on my left cheek. I hate it, but there’s nothing I can do about it. Francine says people who care about me won’t even notice. So far, that only includes her and Sparrow Hawk. When I’m angry, I do something rebellious. I guess I don’t deal well with my anger. Miss Runyon, the headmistress at school, said I was incorrigible and too impetuous for my own good. Francine. She keeps me sane. Getting the best of snooty people who think they’re better than Francine and me. People like Miss Hightower, my chaperone. I guess you could say Mother broke my heart, and Father as well, because they could not love me. Love. I’m afraid no one will ever love me because my birthmark makes me ugly and some people think I’ve been marked by the Devil. 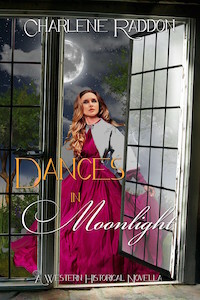 Be sure to come back to read more about Charlene, Elizabeth, and DANCES IN MOONLIGHT on Wednesday’s Karen’s Killer Book Bench. Happy Reading! Hi, Charlene! That sounds like a really good story. Hi Charlene! It’s really sad knowing people like Beth that are treated as an outcast. I’m glad she had Francine. I hope she will find a family with someone who truly care about her. Hi Charlene. Thanks for the character interview! I ‘m interested in reading her story! Char, your book sounds like one I would love to read. I hope I win! I enjoyed your character interview. It’s a fun format! Beth sounds like an interesting character!